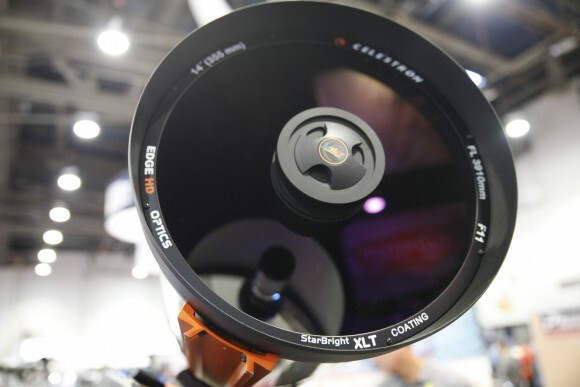 Celestron has put its main focus on WiFi enabled telescopes and microscopes this year. The idea is to enable telescopes and microscopes to be controlled and viewed through your WiFi network via an app on your smartdevice or on your computer. Not only is this making it more convienient for experienced astronomers, it makes more advanced telescope features like autotracking and autoguiding more accessible to beginners. Something which I think is great. You can connect Celestrons new telescopes with their free SkyPortal app which has over 100 000 celestial objects. This technology doesn’t just make good old telescopes more advanced, it allows you to control them from the comfort and warmth inside your home. Which I find truly excellent. It makes those nights that are just too cold for astronomy much more convenient for viewing. In theory you could also use your telescopes while you are away from your home, depending on how your setup looks. The telescopes have built in powerbanks for up to 10 hours of use, as well as the ability to charge your smart device through it. Celestron also featured WiFi enabled microscopes. The idea is essentially the same, making it possible to view through your microscope wirelessly. Torrance, CA (January 6, 2015) – Taking its cues from some of the hottest trends in consumer electronics, Celestron brings a unique perspective to your smartphone or tablet with a full range of telescopes and microscopes with fully integrated WiFi. The world’s #1 telescope maker will showcase its latest WiFi gadgets at this year’s Consumer Electronics Show in Las Vegas. Following up on the success of 2014’s Cosmos 90GT WiFi, the company’s first WiFi telescope, Celestron sets a new standard with NexStar Evolution family of WiFi-enabled Schmidt-Cassegrain telescopes. Hailed as “the coolest app-cessory in the galaxy” by Wired.com, NexStar Evolution works seamlessly with the free Celestron SkyPortal planetarium app, featuring a database of over 100,000 celestial objects. Equipped with Celestron’s signature 6-, 8-, or 9.25-inch optical tube, NexStar Evolution offers impressive views of even faint, deep-sky objects. NexStar Evolution was thoughtfully designed based on customer feedback to be the most elegant consumer telescope ever built. It features the first rechargeable lithium-ion battery offered on a computerized telescope, with enough power for a 10-hour stargazing marathon. You can even charge your smart device while you observe using the integrated USB charge port. WiFi integration also comes to the lab with Micro Fi, Celestron’s cutting-edge digital microscope. This battery-powered, handheld low-power microscope uses the free Micro Fi app to provide a live streaming feed to up to three smartphones or tablets. With a range of 30 feet, Micro Fi is great for group work on a single specimen. A two-element IR-cut lens ensures clear resolution, an adjustable six-ring LED illuminator provides just the right amount of light, and the built-in camera captures both still photos and video. All of Celestron’s WiFi products will be on display at the 2015 International CES, taking place January 6-9, 2014, at the Las Vegas Convention Center. Visit Celestron in Central Hall, booth #14444 to explore our exciting 2015 product offering. Celestron is a leading designer, manufacturer, and importer of high-quality optical products including computerized and non-computerized telescopes and related accessories, GPS devices, binoculars, spotting scopes, and microscopes. 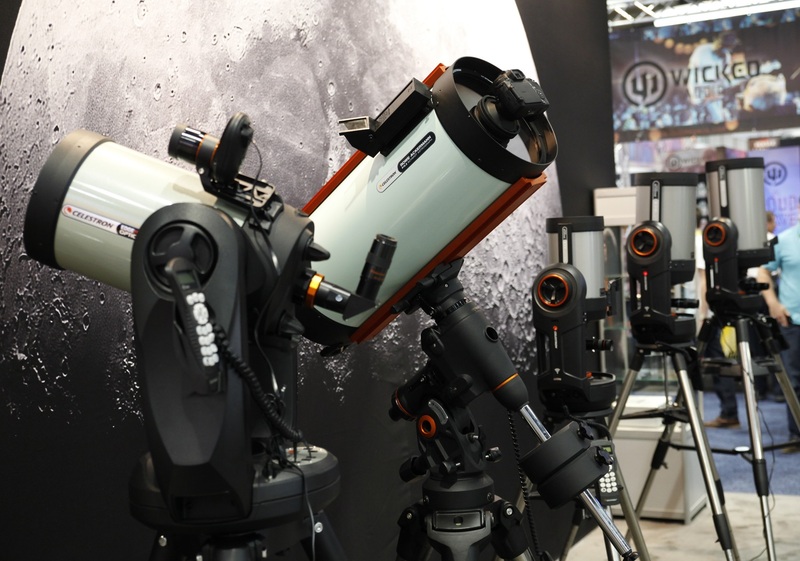 Since manufacturing its first telescope in 1960, Celestron has grown to become the world’s #1 telescope maker, and enjoys brand-name recognition among serious amateur astronomers for superior optics, outstanding design, and innovative technology. Celestron’s extraordinary products continue to receive numerous industry and consumer media accolades, adding to an already impressive list that includes awards for product innovation from Reader’s Digest, Popular Science, PC Magazine, Popular Mechanics, the Consumer Electronics Association, and more. Celestron is a privately held company with corporate offices and manufacturing facilities in Torrance, California. Next: The Worlds Most Useless Machine? I hope I can buy this as an add on. The cable system is really annoying.